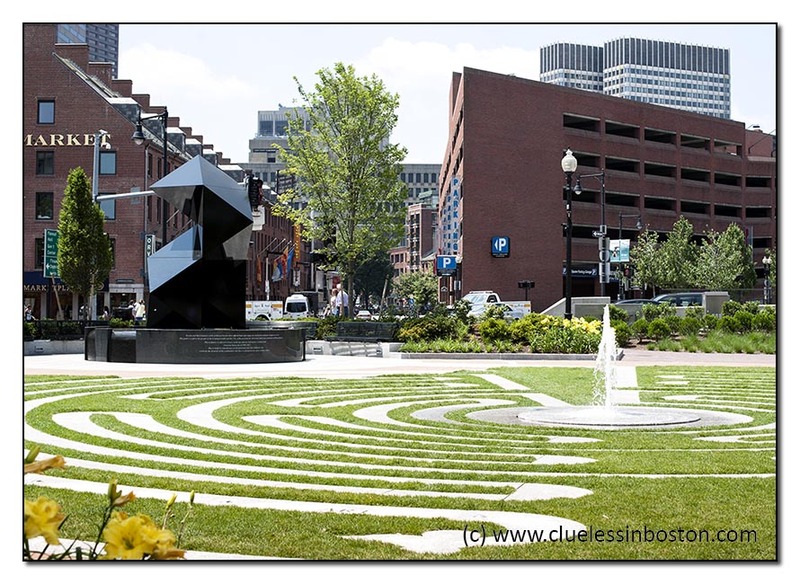 The Armenian Genocide monument is located near Fanueil Hall and was dedicated in May of this year. The Armenian Genocide refers to the systematic killing of the Armenian people by the Ottoman Empire at the end of World War I. According to the Armenian National Institute, 43 states, including Massachusetts recognize the Armenian Genocide. The sculpture, a 12-sided abstract geometric shape, a split dodecahedron, is resting on a 16-foot diameter reflecting pool and will have 24-26 different configurations. The monument is ringed by benches and visitors may walk the Labyrinth, which celebrates the journey of life. Annually, the sculpture will be reconfigured to commemorate lives lost during the 1915-23 genocide and all other massacres that have marked the immigrant experience. Below is a close-up view of the monument and you can see the water reflecting on several sides of the monument. No problem with Turkey?.. Here ,France recognized the genocide, and Turkey did not forgive it , and makes much problems to us.. The monument is very impressive, I like the idea of labyrinth. What do you mean by "will be reconfigured"? This is an appealing monument. I am not up on my Armenian history, so I don't follow the debate with Turkey. And, reconfiguring the monument every year? That just might be one step too precious. As the Beatles said, Let It Be. That is so beautiful. The list of 20th century massacres and genocides is very long and yet there are only two events that have been recognised as genocides since the term was coined in 1948 (therefore, events subsequent to the Holocaust): Rwanda and Srebrenica. Some say the legal definition of the term is too cumbersome and it is too difficult to apply the definition and prosecute it. I say equal credence and recognition needs to be given to war crimes and crimes against humanity. If this sculpture makes people think of terrible atrocities even for a short time, then it's doing it's job..too many people forget and think it couldn't happen these days, when it's happening all the time in one way or another. Thank you for sharing this one! I had read about the new monument but have not had the opportunity to see it myself just yet... it looks lovely. Beautiful sculpture and interesting that it will be configured yearly. Maybe I'll get to see the monument the next time I'm in Boston. 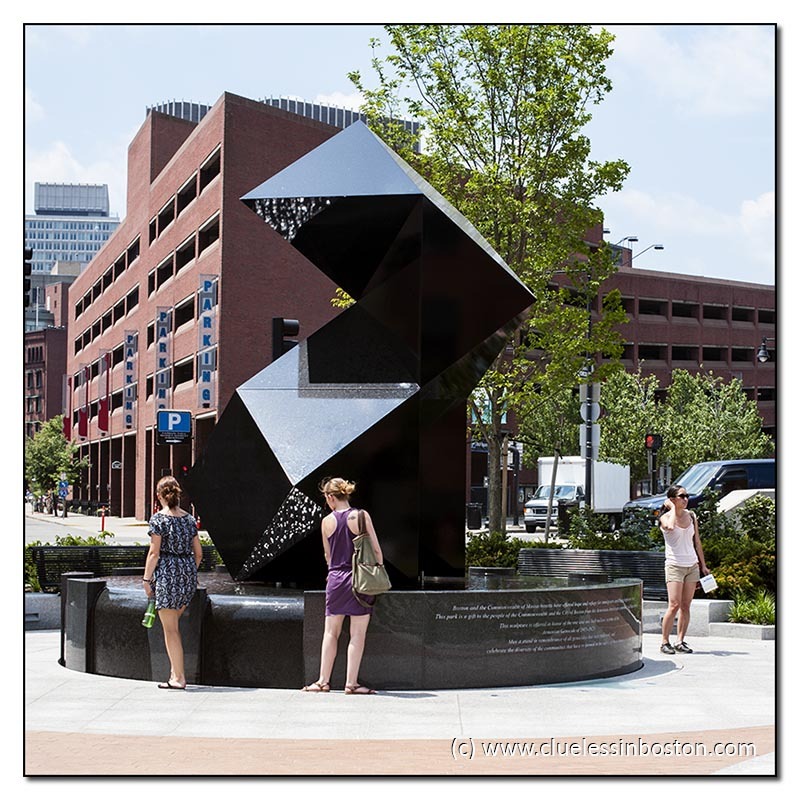 Harriet: the monument "rests" on small metal dowels, with many others embedded in the monument base allowing the geometric shape to be moved/configured into another position. I am very interested in this procedure and will try to witness the process.